Local Electricians Marin County: The Tesla 3 is Coming, Do You Have the Home Car Charging Station For It? To the surprise of almost no one, Tesla’s Model 3 has been selling like hot cakes this year. In fact, investors and the heads of the company alike actually believe they’ll exceed their initial sales projections for the game-changing electric vehicle. This is partly because the electric vehicle maker has figured out a way to increase their production in a meaningful fashion. Because it’s actually accessible, the Model 3 has become one of the most sought after vehicles in the sedan category on the market. Here’s why you should get on this train to the future of transportation by investing in the most desirable vehicle. Let’s just say, it’s popular for a reason. Although Tesla sold a whopping 18,000 Models 3s in November, it’s still looking to appeal to more people. Quite simply put, it’s because they have more in their objective than to simply acquire more profit, they’re fueled by the possibility that they might be able to limit greenhouse gas emissions. In other words, they’re only trying to save the entire world and so, of course, they’re attempting to appeal to the majority of the market. They have trims that span from basic to totally luxury which is really just the beginning of their growing attraction. As you know, there’s a federal tax credit coming down the line for the folks who are able to buy a greener, better car (insert any EV here) by the time the bell tolls on the last day of 2018. For that reason, there is a fair amount of speculation that sales for Tesla as a whole will take a dip once 2019 winds around because that tax credit will no longer be available. We think differently. The only real reason Tesla isn’t selling more cars is because it can’t produce them faster. They’re only selling as many as they can produce and so their sales are limited due to their inventory. They have plans in December to change that by implementing a new production schedule that should be able to turn out around 6,000 units per week. In June of this year, they were only producing around 5,000 Model 3 units per month and only around 26,000 total units for the first half of the year. That doesn’t mean the Model 3 or Tesla itself is out of style, on the contrary, it means it will be the only suitable option for people who still want a sedan. How many people still want sedans? The short answer is most people still want sedans. They’re a happy medium on safety ratings and are uber affordable to power and maintain. If you don’t have to cart around 5 kids and their friends or everyone’s ski gear, there’s not much reason for a bigger vehicle, meaning Tesla will fill the gap in the market with a clean energy option that looks ultra chic. 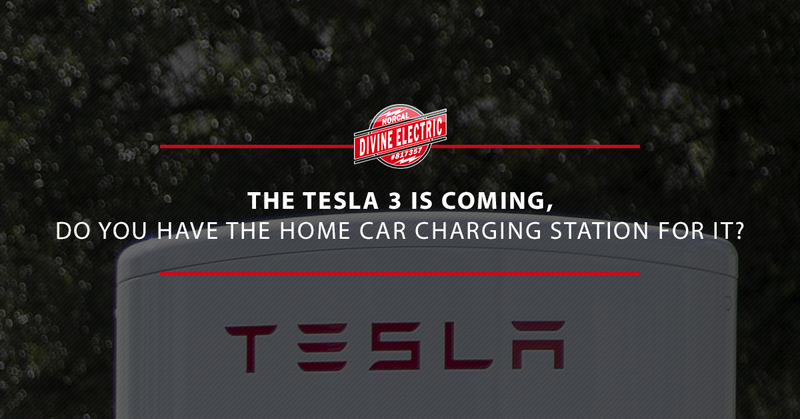 Invest in a Tesla and be on the right side of history and then, contact Divine Electric, the premier local electrician in Marin County to get your home car charging station installed and ready for your new Model 3 when it arrives. Don’t worry, we’ve laid out how to charge yours and everything else you need to know about home car charging stations already.